Taekwon-do is a Korean art of self-defense. Contrary to the teachings of many of my fellow master instructors, practitioners and predecessors, Taekwondo did not originate thousands of years ago in ancient Korea. Rather, Taekwon-do is a collection of similar unarmed martial arts techniques and foundations created by a number of Korean Grandmasters, including General Choi Hong Hi, when they returned to Korea from Japan following World War II. While in Japan, these Grandmasters learned Karate-Do (meaning way of China Hand or way of Empty Hand) and the techniques they learned formed the basis for a new martial art. On April 11, 1955, General Choi, then a general in the South Korean army, began to unify and systematize these related martial arts disciplines by giving Taekwon-do its name and its beginnings. In 1961, General Choi became the first President of the Korea Tae Kwon Do Association, and until his death in 2002, he worked tirelessly and selflessly in the promotion of Taekwon-do and in the scientific advancement of Taekwon-do techniques. Below you can find a more detailed list of the highlights of the development of martial arts on the Korean peninsula from ancient times until the present. As you will see, Taekwon-do is not a martial art that was developed by one single person, nor can it be traced back to any one individual. Instead, Taekwon-do is a discipline that has scientifically developed into a system of various theories, terminology, techniques, methods, rules and spiritual foundations. As a result, the discipline, or the Way, can be constantly improved upon by its senior practitioners and instructors. This flexibility allows my fellow teachers and me to teach the fundamentals of Taekwon-do to new generations, and the next generation of teachers can in turn teach the Way of Taekwon-do to following generations, in each case adapting Taekwon-do to the changing times and students, while remaining true to the founding tenets. I consider Taekwon-do to be a living art of self-defense that will continue to evolve for years to come. • 751 A.D.: At Sok Kul Temple, a statue of Kumgang Yuksa, a famous warrior, was erected in a martial arts fighting stance in a small Buddhist cave during the reign of King Hye-Gong (742-762). • 935 to 1392: During the Koryo Dynasty, the fighting art Taek Kyon was founded. • 1147 to 1170: Soo Bak Ki is believed to have peaked in popularity. This was during the reign of King Uljong. Some historians believe that it was during this period that nei-chia or nae-gong (internal kung-fu) and wai-chia or wae-gong (external kung-fu) was introduced in Korea. This time period corresponds to China's Sung and Ming Dynasties. • 1392 to 1907: Yi Dynasty. Some historians of Karate believe that envoys from Okinawa learned Soo Bak Ki from mainland China and introduced it to Okinawa. A book on Soo Bak Ki was published during the Yi Dynasty to act as a training aid for the military. • 1921 to 1945: Karate (also known as Do-Te or Okinawa-Te). During the years of Japanese occupation in Korea, the practice of fighting arts was banned. • 1936: The concept of "Do" was introduced and "Karate" became "Karate-Do." • 1945: Korea is liberated from the Japanese. Quite a few Koreans (e.g. Choi Hong Hi, Ro Byong Jik, Lee Won Kook and more), who practiced Karate in Japan, brought their martial arts training back to Korea after World War II. • In 1945, the first organization to teach martial arts in Korea, Cho Sun (Korean) Yeon Moo Kwan, which was to influence Taekwondo, was formed. Judo, Karate-Do, Gom-Do (swordsmanship), Kwon Bop (Chuan-Fa in Chinese and Kenpo in Japanese) were taught. • 1945 to 1955: Taekwon-do Kwans (associations) were formed: Chung Do Kwan, Ji Do Kwan, Moo Duk Kwan, Oh Do Kwan, Chang Moo Kwan, Kang Duk Won and Song Moo Kwan. The name Taekwon-do was created on April 11, 1955. For ten years, however, Taekwon-do was also called Gong Soo Do (meaning empty hand), Tang Soo Do (meaning China hand) and Soo Bak Do (meaning fighting hand). • 1961: The Korea Tae Kwon Do Association was founded, recognizing the nine Kwans. It then changed its name on September 16, 1961 to the Korea Tae Soo Do Association and then changed back to the Korea Tae Kwon Do Association on August 5, 1965. • 1962: On June 20, the Korea Athletic Union recognized Taekwon-do as one of its national competitions. • 1964: On September 3, Taekwon-do was officially recognized by the Korean Athletic Union as a national event with seven weight categories. • 1966: The International Taekwondo Federation was founded. • 1971: The International Taekwondo Federation reached 67 countries. • 1972: The Kukkiwon was founded. • 1973: On May 28, the World Taekwondo Federation was founded. 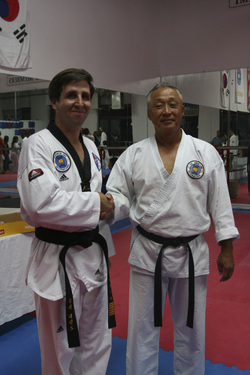 The First World Taekwondo championship at the Kukkiwon was held. By then, Taekwon-do was being practiced in 108 countries and 200 instructors were teaching in schools around the world. • 1980: The International Taekwon-do Federation introduces Taekwondo to Poland, the former Soviet Union and North Korea. • 1994: Taekwon-do becomes an official Olympic event. • 2004: Taekwon-Do International is founded. The growth of Taekwon-do around the world from 1955 until now has been astronomical. As a result, in 1994 Taekwon-do was recognized by the International Olympic Committee as an official Olympic event and in 2000 it debuted as a medal sport at the Sydney Olympics. The true Grandmasters of Taekwon-do around the world deserve wide recognition for their untiring efforts in the promotion of Taekwon-do, and credit for the tremendous success and acceptance Taekwon-do has received.